A Budget-Priced 1911 in .22LR … or Is It? Several months ago the 1911 world was agog over the introduction of a dedicated .22 Long Rifle pistol in the guise of a 1911, with an MSRP more akin to the selling price of a .22LR conversion kit than to a complete firearm. Intrigued, the M1911 Pistols Organization immediately contacted Chiappa Firearms, Ltd., the manufacturers of the Chiappa 1911-22. The company responded almost immediately and said they would be pleased to forward a sample pistol to our reviewer. The FFL was sent … and no pistol arrived. More e-mails were exchanged, telephone conversations ensued, more promises to send a pistol for evaluation were made … and still no pistol arrived. When the Chiappa 1911-22 was first announced, the shop at the range where I shoot snapped up two of them on the supposition that a 1911 in .22LR caliber would probably sell quickly. It transpired that they were half right. One of the two pistols did indeed sell quickly, but the second is still in the display case, many months later. When I was at the range a few days ago, I encountered a fellow shooter whom I knew slightly from previous meetings at the range, and whom I also knew to be the person who had purchased the 1911-22 that the shop had sold. And it also turned out that he had sent the pistol to the manufacturer under warranty because it would fire even with the thumb safety engaged. The pistol had just come back from the repair depot and he was there to pick it up. On the theory of “nothing ventured, nothing gained,” I took him aside, explained that M1911.ORG would like to test a Chiappa 1911-22 but that the company had failed to deliver on multiple promises to send us a gun for evaluation, and I asked him if he might be willing to allow us to use his pistol as our sample for an evaluation and write-up. Thankfully, he readily assented. Since the pistol was already in the shop’s bound book on its way back from the repair, the gun owner and the shop owner agreed to leave the pistol at the shop for a few days so that we could shoot it, photograph it, and write it up. The following article is the result, and we give our thanks to Chris Dogolo (the range owner), Mike Rubino (the FFL), and Eduardo Torrealba (the owner) for making it possible. The Chiappa Firearms 1911-22 is a full-sized, semi-automatic pistol, chambered to fire the .22 Long Rifle cartridge, and styled to look as nearly as possible like a traditional M1911A1 military sidearm of World war 2 vintage. At first (and even second) glance the pistol looks virtually indistinguishable from any of a number of commercial M1911A1 clones and near-clones … except for the very small diameter of the hole in the end of the muzzle. The weight, too, is nearly the same as that of a standard M1911A1. In fact, the heft of the Chiappa 1911-22 feels much more like holding a “real” M1911A1 than does the .22LR Kimber Rimfire which, due to its aluminum alloy frame and slide, is much lighter than a standard M1911A1 and simply feels “insubstantial” when first picked up and held. The Chiappa 1911-22 is not made of aluminum alloy. 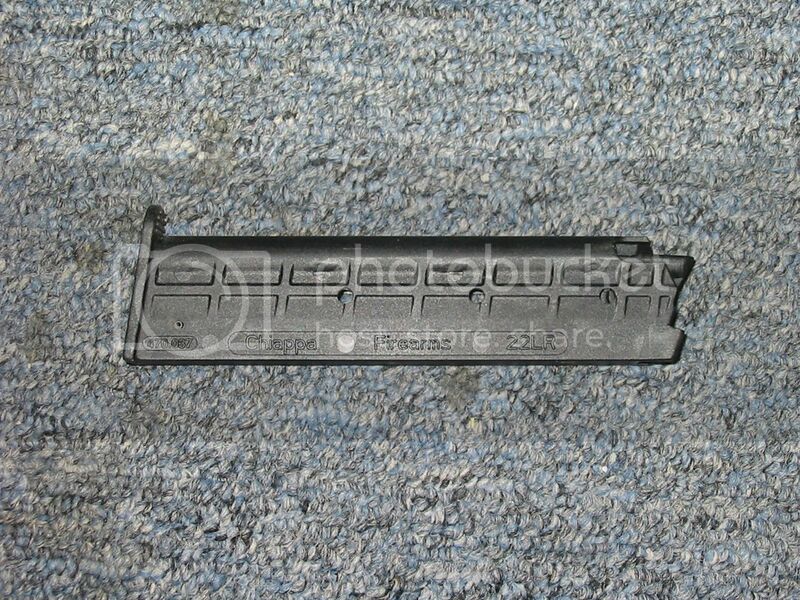 Both the frame and the slide are made of a material the company calls “Chiappalloy,” the chemical and metallurgical composition of which is proprietary. To this reviewer, it both looks and feels like Zamak (which is closely associated with “pot metal”), but that is purely conjecture. 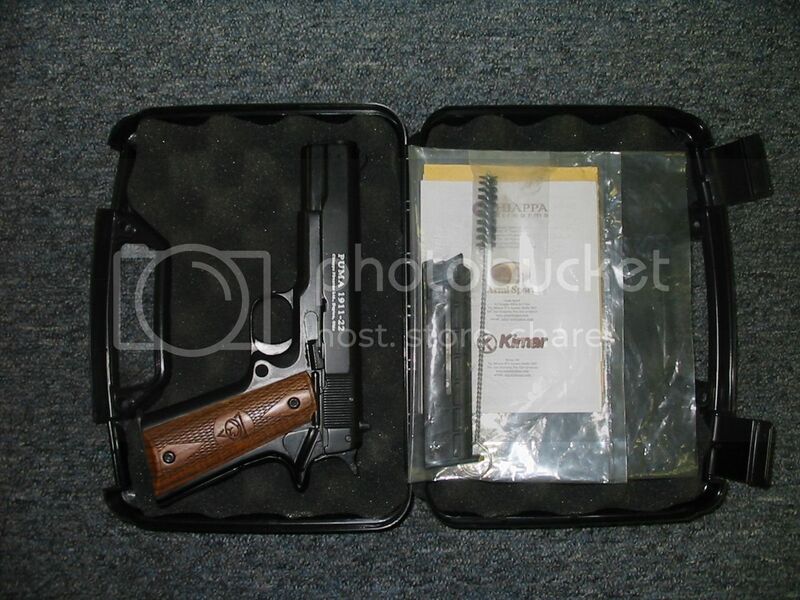 The Chiappa 1911-22 comes in a fairly standard plastic, clamshell gun case, with an instruction book and a cleaning brush. The personally-owned pistol we borrowed for this test had two magazines, but we do not know if that is standard or if the owner had purchased a second magazine separately. 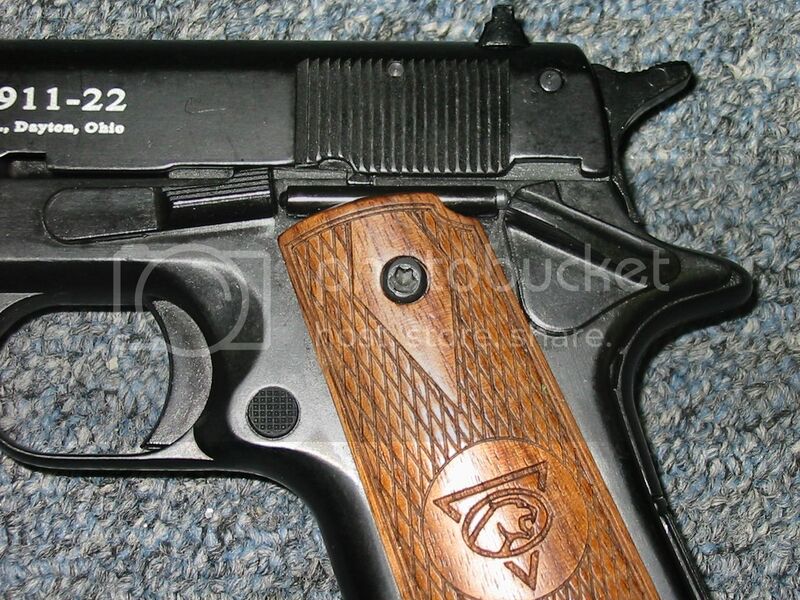 Chiappa Firearms, Ltd., sells the 1911-22 directly under their own name. They also sell it through Legacy Sports under the Puma brand name. 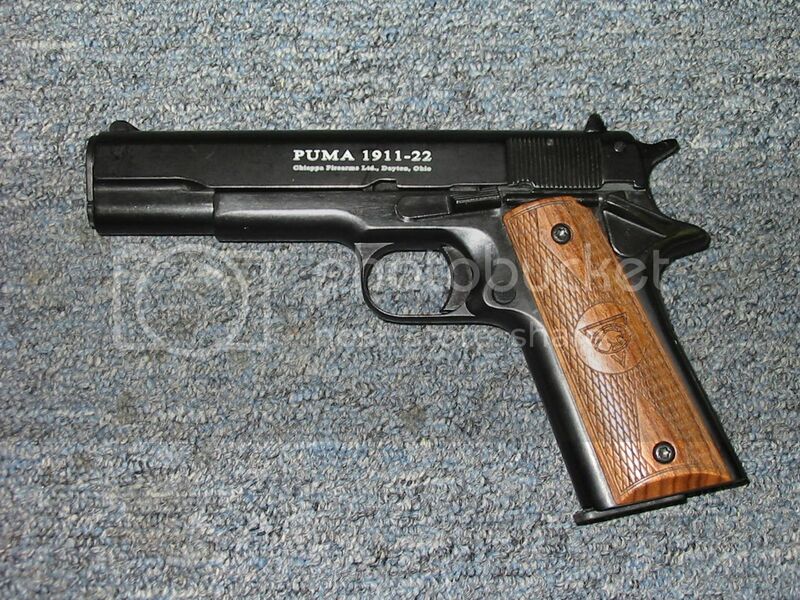 Our test pistol happened to be the Puma brand variation, but it is the same pistol regardless of which name is on it. (As will become significant as we progress, it should be noted that Chiappa Firearms is also the manufacturer, under the name Kimar, of an 8mm blank-firing replica of the M1911A1; the Kimar blank pistols are manufactured in Italy.) The Chiappa 1911-22 looks and feels like a .22LR rendition of an M1911A1. But … is it? Let’s peek under the hood and find out. One of the first obvious differences between the Chiappa 1911-22 and a “real” 1911 is the lack of a functional grip safety and removable mainspring housing unit. The frame is cast as one piece. There are detail lines to mimic the appearance of the M1911A1 grip safety, but on the 1911-22 it is an integral part of the receiver, does not move, and serves no function. The lower portion of the backstrap, which on any “real” 1911 is a removable unit housing the coiled hammer, or “main,” spring, is also cast as an integral part of the receiver. The hammer spring is not at all similar to a 1911 hammer spring. Instead, it is a light coiled spring that resides high in the frame next to the hammer and operates in rotation, rather than in compression. Although the trigger is similar to a real 1911, with a ‘U’ shaped metal stirrup that straddles the magazine, the sear and the lower portion of the hammer are completely unlike standard 1911 parts. 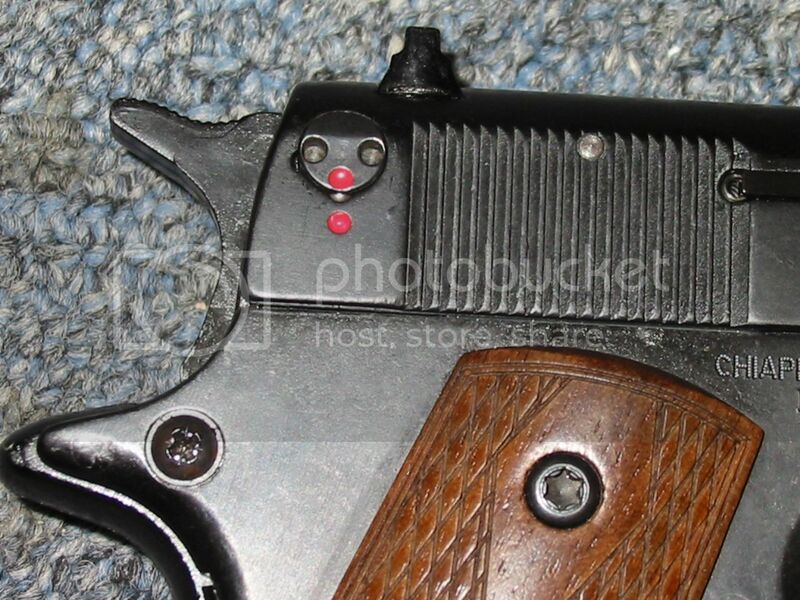 The 1911-22 is equipped with both a thumb safety and a slide stop on the left side of the receiver, with a conventional-appearing plunger tube between them. 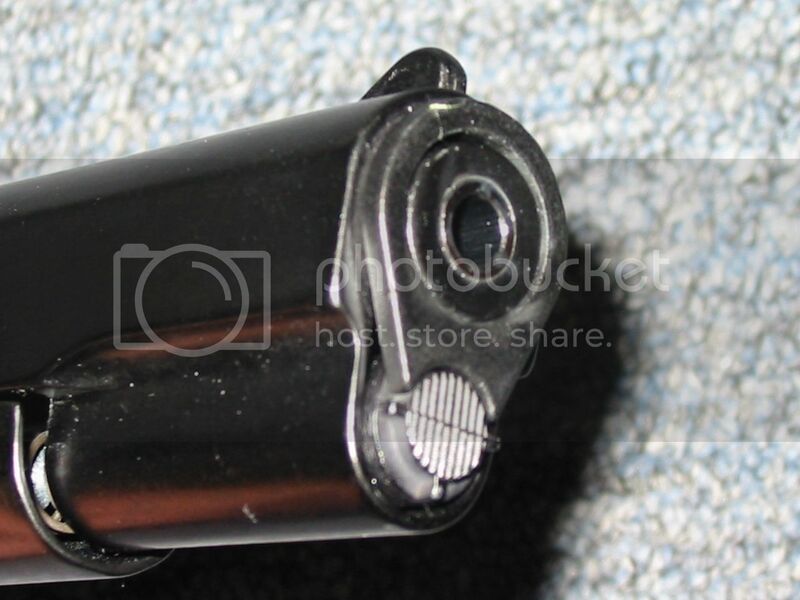 The slide stop can be used to hold the slide open, but it does not lock the slide in the open position after the last round has been fired. Since the same holds true for the Kimber Rimfire and for all the aluminum-slide .22LR conversion units (except one that has a steel insert to protect against peening), this was not a surprise and should not be regarded as a “negative.” The thumb safety can be engaged whether or not the hammer is cocked, another departure from the 1911 manual of arms. The grip panels are wood grain, with a nice double diamond checkering pattern and a manufacturer’s logo midway between the diamonds. But … they are plastic, not real wood. 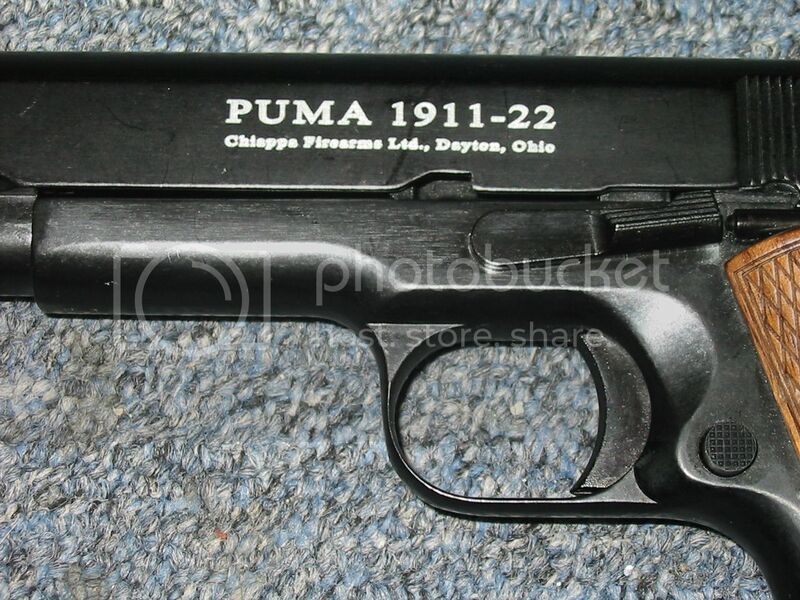 (This may be a peculiarity of the Puma rendition of the pistol. 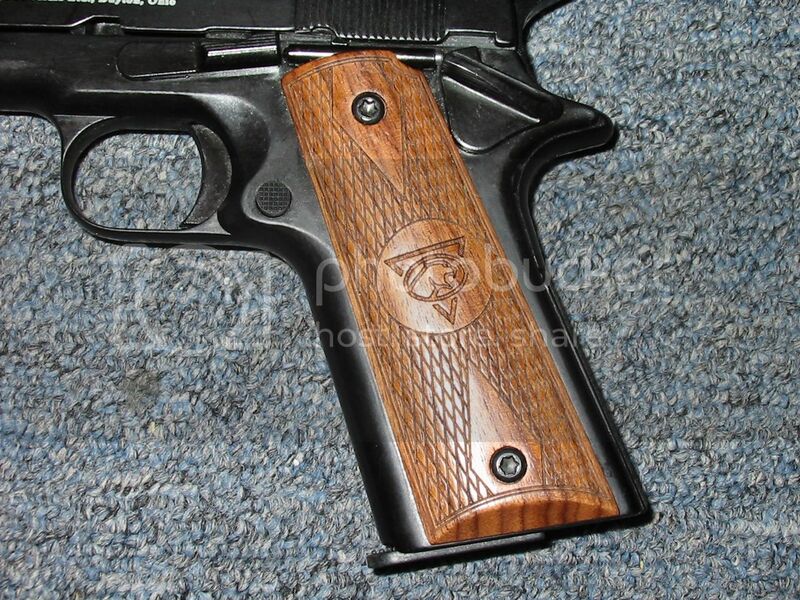 Chiappa's web site indicates that the grip panels are wood.) Unlike the Kimar 8mm blank-firing pistol, however, the spacing of the grip screws is standard 1911 and we were able to install genuine 1911 grips on the Chiappa 1911-22. The “gotcha” turned out to be that standard grips are just a hair wider than the plastic Puma grips, and would not allow the thumb safety to be disengaged. If an owner wanted to use custom grips on a 1911-22, a few minutes with a file and sandpaper would rectify this condition. 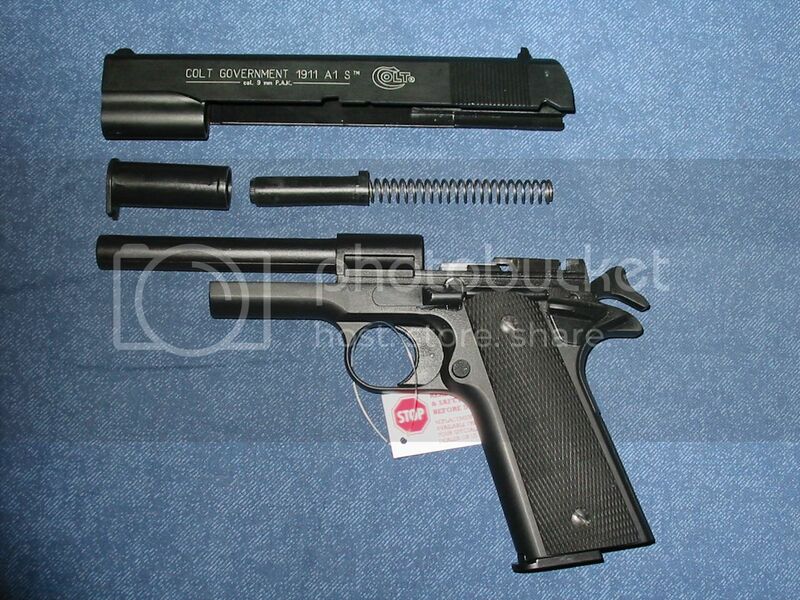 The 1911-22, like the Kimber Rimfire and most (perhaps all) .22LR 1911 conversions, uses an external extractor. Again, this came as no surprise. The extractor on the 1911-22 appeared to be significantly more substantial than the extractor on a Kimar 8mm blank-firing 1911 we used for comparison. An interesting addition, not seen on any .22LR conversion kits and not seen (or needed) on the Kimar blank-firing 1911 was a rotating lock built into the rear of the slide on the right side. The lock is actuated by a small spanner wrench/key that is shipped with the instruction book. The test pistol was unlocked when we received it, and we did not attempt to try the lock because we didn’t want to risk injuring a friend’s personally owned firearm. The magazines are plastic or polymer, in a smoky translucent shade. We found this to be a surprise, because both the Kimar 8mm blank-firing 1911 from Italy and the similar Colt/Umarex 9mm blank-firing 1911 from Germany use steel magazines. Regardless of why the 1911-22 uses plastic magazines, the test gun functioned flawlessly with several types of .22LR ammunition. The real surprise comes when the Chiappa 1911-22 is field stripped. The procedure is very different from that for an M1911A1, and the result is quite an eye-opener. To field strip for cleaning (which is about the only service the owner can perform on this pistol), the recoil spring plug is depressed, the barrel bushing is turned 90 degrees, the recoil spring and plug are removed, and then the barrel bushing can be removed from the slide. The slide stop is removed in fairly standard fashion. And then, rather than just slide the slide and barrel forward and off the receiver, the slide is pushed as far to the rear as it will go. 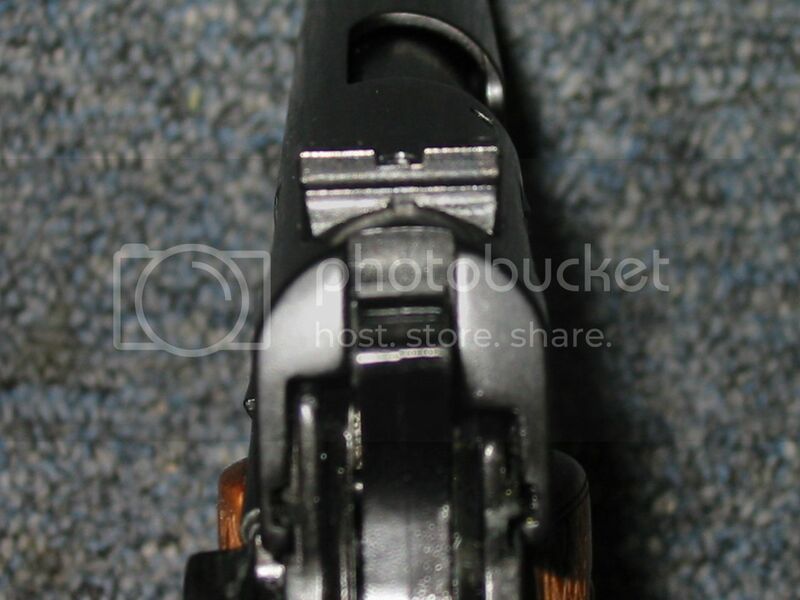 The back end of the slide is then lifted (or tilted) up to disengage it from the mechanism beneath, and then the slide can be moved forward and removed from the pistol. Observant readers may have noticed that I wrote “the slide” can be moved forward and removed. I didn’t mention the barrel, and that was not an accidental omission. The reason is that the 1911-22 does not use a separate barrel. 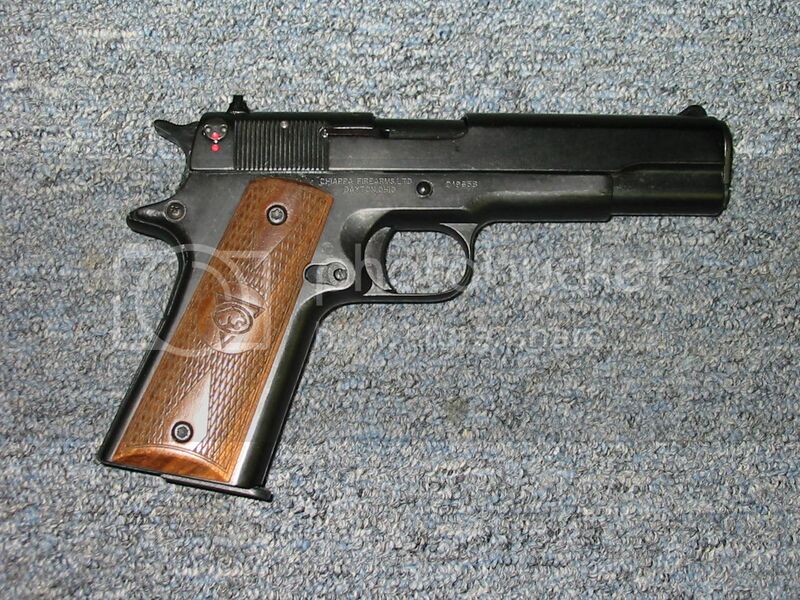 In fact, the 1911-22 appears to me mechanically identical to the Kimar 8mm blank-firing 1911, which has its fake, plugged barrel cast on a riser as an integral part of the receiver. The Colt/Umarex 9mm blank-firing 1911 is made the same way. The Chiappa 1911-22 also has the barrel cast on a fixed riser as an integral part of the frame, and then the manufacturer simply bored out the barrel and fitted a rifled steel .22 caliber sleeve. Filed stripped. The photo shows the Colt/Umarex 9mm blank-firing pistol, but the Chiappa 1911-22 looks identical when field stripped. Early reports from owners suggested that most people were surprised by the accuracy of such an inexpensive pistol. The design helps to explain this; the barrel remains fixed to the receiver, so it cannot shift each time the pistol is fired. The downside, of course, is that the sights are mounted on the slide, and the slide can shift relative to the barrel from shot to shot. With that, let’s see how it shot. We grabbed a motley assortment of .22LR ammunition from the shelves of the range store (yes, we paid for it! ), and headed downstairs to the range. The pistol handled well, we experienced no malfunctions with any ammunition (other than the usual and customary dud rounds when shooting Remington Thunderbolt), but we weren’t excited about the accuracy. Because this is a full-size pistol with a 5” barrel, and because we expect that many buyers may be looking at this pistol for serious target shooting rather than “plinking,” we shot our tests at 25 yards, not at 25 feet. The results were acceptable … but not by any means exceptional. In addition, at both 25 feet AND at 25 yards, the groups all clustered several inches below point of aim, regardless of ammunition. One of the reasons the accuracy was worse than I had expected was, in this writer’s opinion, the horrible trigger pull. The trigger felt extremely heavy, uneven, and gritty. The pull didn’t seem to be the same from one shot to the next. By the end of the accuracy portion of the testing, my trigger finger hurt so badly that what is normally the fun portion of a gun test … the plinking after the serious work has been concluded … was not fun, because every pull of the trigger further irritated my already sore trigger finger. We took the pistol into the work room and attempted to measure the trigger pull. The shop has an RCBS analog trigger pull scale that reads up to 8 pounds. The trigger pull on this pistol was well off the scale. Extrapolating visually, I would estimate that (if the scale were calibrated farther out and if the readings remained constant) the pull weight was approximately 10 pounds. The shop had another Chiappa 1911-22 in the display cabinet, unsold. Out of curiosity, we took that one out and measured it. It was even worse. It was beyond the range of movement of the RCBS spring and plunger, which probably translates into a trigger weight in excess of 12 pounds. The Chiappa 1911-22 will undoubtedly fill a niche in the marketplace. Many owners of .45 caliber 1911 pistols would like to be able to practice using a pistol that looks and handles like their primary weapon but that shoots inexpensive .22LR ammunition. While some owners are perfectly comfortable buying one of the several .22LR conversion kits available and swapping “top ends” on their pistol for small bore practice, other people do not want to swap parts on and off their primary pistol. They would like to have a dedicated 1911 pistol in .22LR caliber. While the Kimber Rimfire has been available for several years and has a good track record, it has two strikes against it: First, it is very expensive for a .22 caliber pistol. Second, being all aluminum alloy it is too light to feel anything like shooting a 1911. When I shot a Kimber Rimfire, my reaction was that I had shot airsoft pistols that felt more like shooting a real gun. So an affordable and reasonably accurate 1911-pattern pistol should appeal to a number of prospective buyers, and we feel this is the market at which the 1911-22 is aimed. Regrettably, we have to conclude that they missed. We felt the accuracy was sub-par, and we were very disappointed in the apparent lack of quality in the pistol. It must be remembered that the test pistol had just been returned from warranty service. It was sent in because it would fire even with the thumb safety engaged. The repair facility fixed that, but they sent it back to the owner with the plunger tube loose and ready to fall off the pistol. The trigger pull was horrible, and because the pistol is not internally the same as a “real” 1911, how much the trigger can be improved by tuning and polishing is anyone’s guess. In this reviewer’s opinion, the Chiappa 1911-22 falls short of the mark and we cannot recommend it. 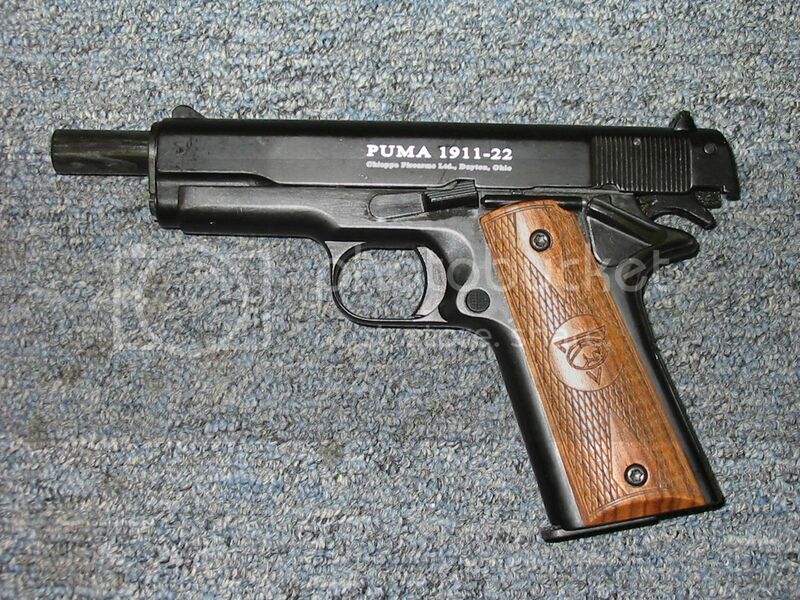 There are two other dedicated .22LR 1911s coming to the market, one from German Sport Guns and one from Colt/Umarex. Both should be competitive in price with the Chiappa 1911-22 and both should be more true to the 1911 design. Personally, I have a dedicated .22 built using a commercial .22LR conversion kit assembled onto a manufacturer’s reject receiver that is perfectly safe and adequate for the .22LR. It looks, feels, and (except for the lack of recoil) shoots like other 1911s. I would never consider exchanging it for a non-standard pistol with a horrible trigger.